This eminent Barolo producer has been around the block more than once since starting in wine 68 years ago. Kerin O’Keefe pays the great man a visit and hears how he has overcome the formidable challenges of recent years, including illness and the firing and re-hiring of his winemaker. At first glance, things appear remarkably unchanged at Bruno Giacosa’s winery during my recent visit. It is almost as if the daunting challenges that the legendary Barolo and Barbaresco producer has faced over the past five years had never happened. Giacosa, one of Langhe’s trailblazing winemakers and an undisputed expert on the area’s top sites, showed off the latest vintages and discussed the past, present and future of this iconic estate alongside daughter Bruna and winemaker Dante Scaglione. 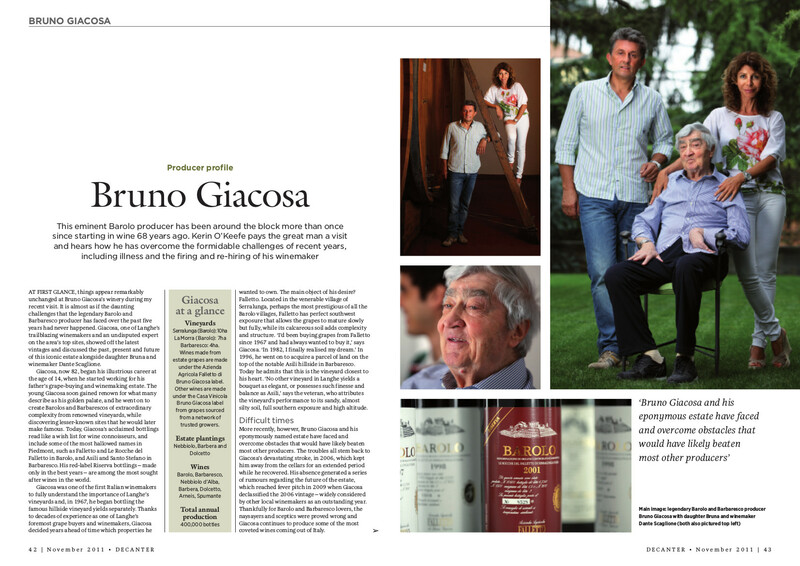 Giacosa, now 82, began his illustrious career at the age of 14, when he started working for his father’s grape-buying and winemaking estate. The young Giacosa soon gained renown for what many describe as his golden palate, and he went on to create Barolos and Barbarescos of extraordinary complexity from renowned vineyards, while discovering lesser-known sites that he would later make famous. Today, Giacosa’s acclaimed bottlings read like a wish list for wine connoisseurs, and include some of the most hallowed names in Piedmont, such as Falletto and Le Rocche del Falletto in Barolo, and Asili and Santo Stefano in Barbaresco. His red-label Riserva bottlings – made only in the best years – are among the most sought after wines in the world. Giacosa was one of the first Italian winemakers to fully understand the importance of Langhe’s vineyards and, in 1967, he began bottling the famous hillside vineyard yields separately. 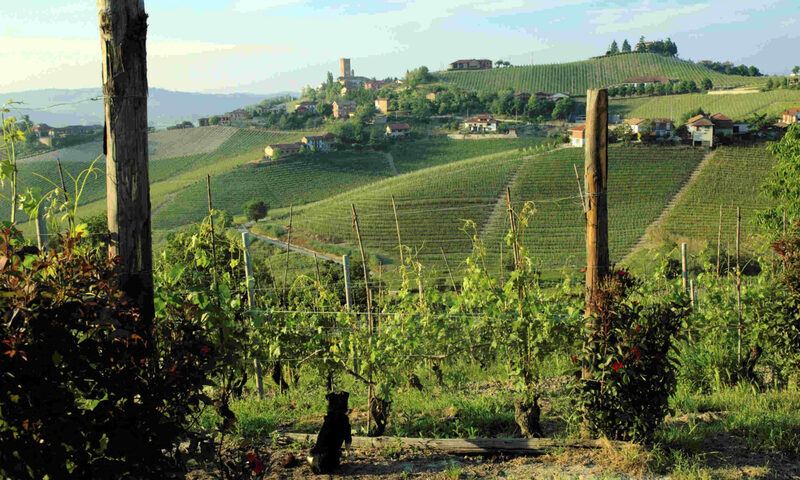 Thanks to decades of experience as one of Langhe’s foremost grape buyers and winemakers, Giacosa decided years ahead of time which properties hewanted to own. The main object of his desire? Falletto. Located in the venerable village of Serralunga, perhaps the most prestigious of all the Barolo villages, Falletto has perfect southwest exposure that allows the grapes to mature slowly but fully, while its calcareous soil adds complexity and structure. ‘I’d been buying grapes from Falletto since 1967 and had always wanted to buy it,’ says Giacosa. ‘In 1982, I finally realised my dream.’ In 1996, he went on to acquire a parcel of land on the top of the notable Asili hillside in Barbaresco. Today he admits that this is the vineyard closest to his heart. ‘No other vineyard in Langhe yields a bouquet as elegant, or possesses such finesse and balance as Asili,’ says the veteran, who attributes the vineyard’s performance to its sandy, almost silty soil, full southern exposure and high altitude. Kerin O’Keefe pays the great man a visit and hears how he has overcome the formidable challenges of recent years, including illness and the firing and re-hiring of his winemaker.